Inferni has always been different from the rest of the groups of 'Souls, owing to its coyote heritage. Over the years, the clan has been marked by conflict and war: as a result, there are several "militarized" operations within the clan. Much is done in the name of preparation. Inferni also has a rich history, of course, owing to its longevity -- this is celebrated and cherished by the clan, of course, but the coyotes also make effort to avoid living too much in the past. Inferni is a coyote clan, but many members are of varied coyote percentages. Coyote hybrids are commonplace in Inferni than purebred coyotes -- this is a long-standing fact. Nonetheless, numerous elements of coyote behavior are quite evident. For example, many members of Inferni depart for years, only to return later on. Extreme cohesiveness and constant loyalty are not particularly valued by Inferni -- all of the leaders have had an understanding of the coyote nature. Forgiveness for departure and long absences are commonplace. Inferni also has historically tended away from large group hunts -- the clan rarely gathers in total for hunts, and instead tends to prefer solo or paired hunting to the larger group hunts of wolves. Inferni also has shown extreme territorial behaviors. In the past, this has owed to a feeling of being encroached upon or disrespected by groups of wolves. In recent years, however, wolves have been increasingly understanding of the coyote clan's claims and way of life. Most of Inferni is prejudiced against wolves, though if a wolf acts ambivalent toward or even curious about coyotes, most of Inferni will treat them respectfully, with varying degrees of standoffishness. A smaller number of them will be outright nasty to wolves regardless of that wolf's feelings toward coyotes. There are one or two coyotes within Inferni that will attack with little or no provocation whatsoever, but Inferni members tend toward neutrality until challenged, especially on neutral territory. Inferni typically does not allow canines without the required coyote percentage to join. In very rare circumstances non-coyotes have been permitted to join the clan -- see the Outsiders list on the Detailed History for a list of Outsiders, their sponsors, and the reason(s) they were allowed to join. Have a good relationship with the non-coyote. Example Mates, lovers, close family, and other similar relationships are most often considered. Extremely close friendship may be enough, but acquaintances or enemies certainly cannot join as Outsiders. Be in good standing with Inferni. Example If Coyote was recently charged with betraying Inferni and holds the Quintus rank, the leadership will not allow his wolf mate to join as an Outsider until Coyote proves himself more worthy of the clan. At least three months play time with your Outsider-hopeful character. Inferni has over ten years history. Included in this history are several wars and conflicts with other packs and groups. Countless litters have been born into Inferni. The ranks have undergone major changes numerous times, and there have been no fewer than nine leaders of the clan. Over 200 characters have been tagged "Inferni" on the 'Souls Wiki. Although Inferni has a lot of history and it is easy to get lost in the pages and pages of it, don't be intimidated! Your character doesn't need to be an Inferni history expert -- if you find the past boring, that's totally cool! The best part of roleplay is that you get to keep creating Inferni's history. This is why we have the long versions of our history on the Wiki -- we want these to be open for anyone to alter and change as Inferni itself grows and changes. Thanks for your contributions! We have so much history, we needed to make two pages on the 'Souls Wiki! Please remember that the 'Souls Wiki is editable by any member of 'Souls. As an Inferni member, we strongly encourage you to share your character's story on our Wiki pages! If your character is an Infernian, they're a part of Inferni history and welcomed on the Timeline or Detailed pages. Thanks! Members of Inferni are frequently blood-related, either via direct relationships like father and daughter or more distant relations, such as cousins, aunts, and uncles. Inferni has also been referred to as a "mafia" thanks to their extensive familial connections; in early Spring of 2008 every single member of Inferni was related in some way. Many of Inferni's coyotes descend from the Lykoi and de le Poer bloodlines, as well as the Massacre and Mogotsi lines. A Lykoi family member has been the Aquila of Inferni for over seven years. The last non-Lykoi to lead Inferni was Roane Kinsella in fall 2006. After that, leadership returned to Lykoi prominence. Leadership passed from Kaena Lykoi to her son Gabriel de le Poer, and on to his son Ezekiel de le Poer. Ezekiel appointed his cousin, Myrika, to lead the clan in 2011, breaking the hereditary chain but nonetheless keeping the Aquila position in the Lykoi bloodline. It remained that way until 2016 when Vesper took the title of Aquila from Myrika -- though her leadership only lasted a short while until Vicira Tears took over, returning the role to the Lykoi bloodline. Inferni has been perceived as vicious, violent, and there are several negative stereotypes regarding the clan. It's certainly true that many of the Inferni coyotes hold certain prejudices against wolves, just as many of them simply wish to live in peace, preferring to keep themselves defending their territory rather than roaming the other lands in search of a fight. Inferni decorates its borders with skulls, bones, and other fearsome decorations -- red paint is frequently used on the skulls and other decorations. These items serve to ward off potential trespassers. Any member may make an addition to the border decor, and Infernians are encouraged to maintain the frightful appearance of their borders. This tradition was imported to Inferni thanks to Gabriel de le Poer, who discovered this practice in the Scintilla War and brought it home to Inferni upon his return in 2006. Inferni does not typically adhere to wolfish standards of dominance and submission. 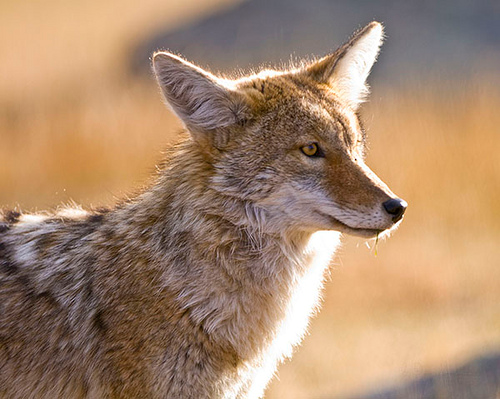 High-ranking coyotes rarely assert dominance without reason; similarly, lower-ranked coyotes do not display submission excessively. So long as an Infernian follows orders and acts in the best interest of the clan, excessive displays of dominance and submission are unnecessary at best and offensive to one's clanmates at worst. Otherwise, the pack instincts of the typical Infernian are not starkly different to that of wolf packs (though the coyotes would like to think so). Within Inferni, there are varying degrees of comradery between the members. Especially violent fighting between members is discouraged, and leaders will attempt to stop such fights. Although Inferni does not strongly enforce its hierarchy in terms of dominance and submission, it is important to remember the clan functions as a military unit. Each canine has a job to do in his or her rank, and failure to perform one's responsibilities can certainly lead to demotion or other consequences. Other evidence of militarization include weapon stockpiles and the construction of archery stands on Inferni's borders. Various forms of livestock have become more and more important to Inferni. A long-standing relationship with wild ravens, beginning in 2007, marked the start of Inferni's focus on partnerships with non-canine animals. Since then, Inferni has expanded into horses and some farmyard-type livestock.